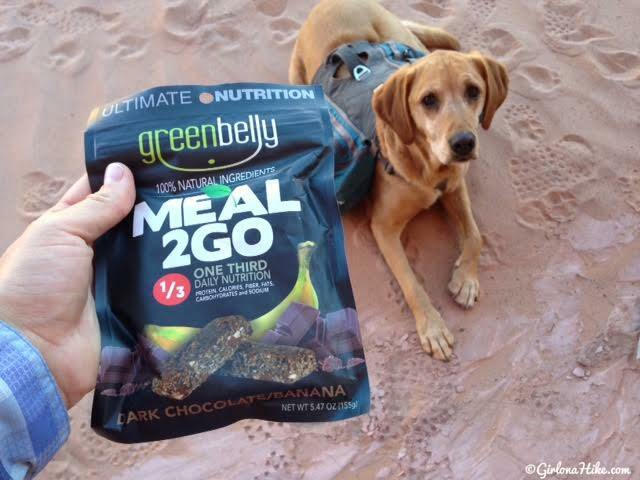 Greenbelly Meals started with one big adventure that turned into a new passion for owner Chris Cage. After backpacking 10,000 miles through Asia, a 3,000 miles bicycle tour of New Zealand, and thru-hiking 2, 185 miles of the Appalachian Trail, Chris Cage often struggled to get in all of his nutrients to fuel his adventures. Creating the perfect meal became his obsession and mission. Enter Greenbelly! 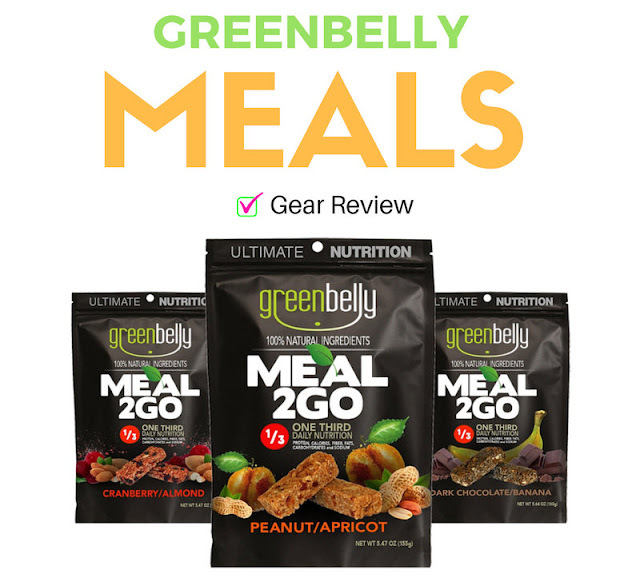 Greenbelly Meals are easy meals with big nutrition, packing in 1/3 of your daily nutrition. With 645 calories, these "bars" will definitely last you a few hours on the trail. As any hiker or backpacker knows, it can be hard to fit in all your nutrients while carry a big pack and hiking for 10+ miles per day. Greenbelly Meals take the hassle away for you, and have created a convenient meal for on-the-go adventurers. I first learned about Greenbelly & Chris Cage through the Joe Rogan Podcast (available on most podcast apps). I loved listening to his stories from his adventures, and could relate to many of his same struggles. He was really knowledgeable about backpacking, and sounded like he really did his research on creating Greenbelly - I knew I had to get in touch with him! Greenbelly Meals offer three flavors: Peanut/Apricot, Cranberry/Almond, and Dark Chocolate/Banana. Each package weighs a mere 5.5 oz (155 grams), and is considered one meal (two bars). Price varies per meal quantity but are about $6-7 per meal (the more you buy the cheaper they are). This was the very first flavor I tried, so I had a few first impressions. My first though when I pulled the bar out of the bag was 1) whoa, they are huge and then 2) yay, I get two bars! I was thinking they were going to be one big brick, based on how the package felt. Many times in the morning I'm not super hungry, especially if I've had one of my Mountain House meals the night before (those suckers stick to your bones!). So I loved that there were two bars in the package. I ate one bar just to see how long it would last until I felt hungry again. Morning 1 of our backpack hike into Little Death Hollow (12.5 miles) all I ate was this, and I was surprised I lasted 4 hours without feeling hungry again. Score! I ate the 2nd bar as my lunch along with some jerky. 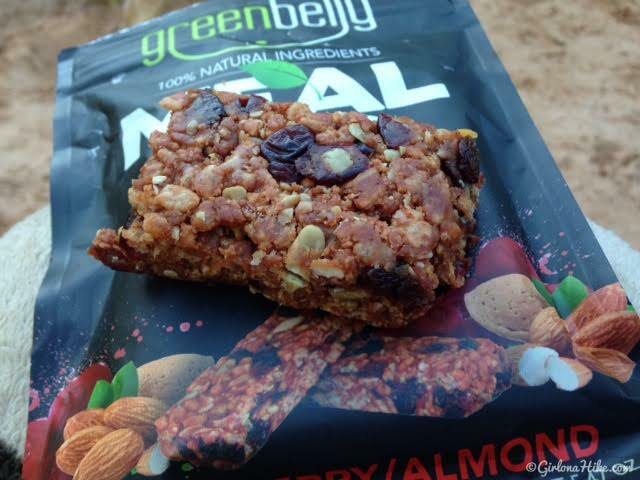 These aren't your typical granola bar - the Greenbelly bars are really "meals." Hearty, dense, and thick. 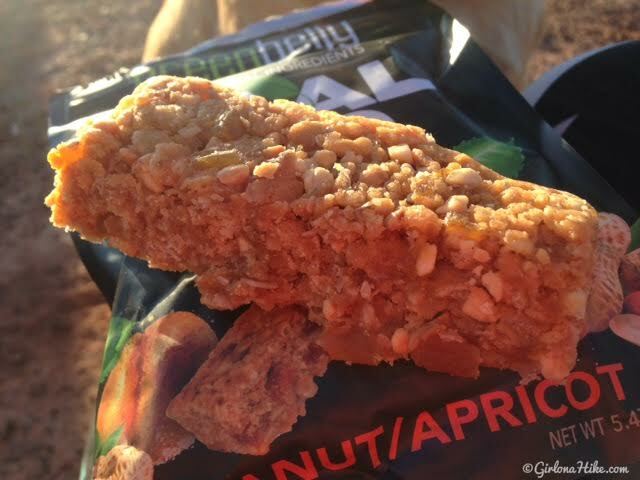 The peanut/apricot has real chunks of apricot, and they bars don't fall apart as you eat them. One of my biggest pet peeves with many granola bars is how easily they crumble. Not these babies. They are really chewy, so you can just pull them apart like taffy. If you are watching your carb intake (Paleo, Keto, or LCHF diets) these may or may not be for you. I try to keep my carb intake on the lower end, so when I saw the entire package was at 100g I let an "oh, god" and whistled. 100g for ONE package? That's just breakfast. I try to keep my grams per DAY under 100-150g. Yikes. This is my personal biggest con about the Greenbelly bars. On the other hand, I try to remind myself that I can easily burn through that in 2-3 hours so does it really matter when you are backpacking? Depends. I wouldn't eat these every day, just on backpacking trips. Breakfast #2 was Cranberry/Almond and my least favorite flavor. I'm not a huge fan of cranberries, so it was on the tart side for me. If you like citrus and a strong flavor, you'll love this one. 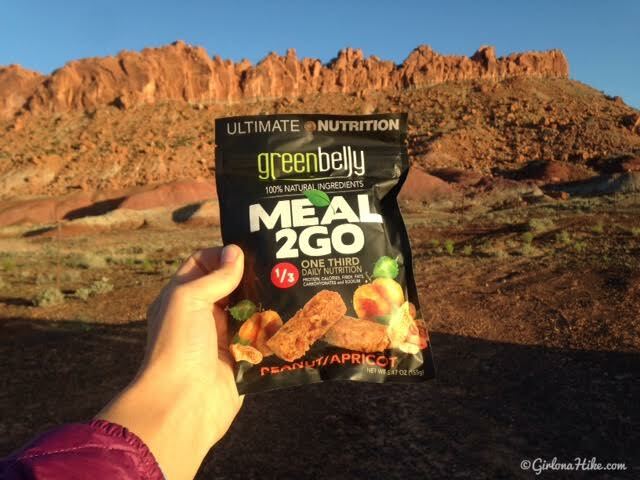 Greenbelly Meals are all gluten-free, sourcing gluten free oats just to be sure. This flavor is also diary free. Like most backpackers, we've all had the super early morning start to the day. This means there is zero time to cook breakfast before your big day hike. Unlike many breakfast options, you don't have to re-hydrate these bars. Just open the bag and go. I love that they have a ziplock in case you don't want to eat the whole pack. The ziplock package also doubles as a mini trash bag. No worries about cleaning dishes or boiling water, these meals are perfect for on-the-go hikers. I saved the best for last - dark chocolate/banana. My favorite flavor, by far. 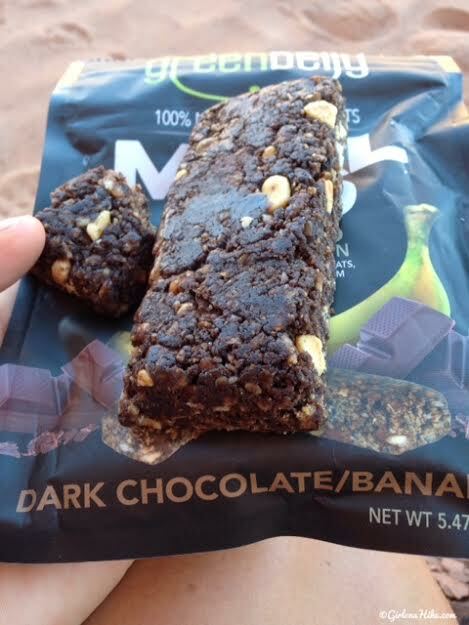 Chunks of dark chocolate, nuts, and dried bananas, who can say no to that? Even Charlie looks like he wants a piece! Sorry Charlie - no chocolate for you! These meals are so moist and chewy, not dry like most power/granola bars. You are actually eating real food. This flavor was hard for me to stop eating - it was so good! As mentioned I ate all flavors as my breakfast while backpacking, but this flavor could easily be substituted as your desert - break it up into a few pieces and share it with friends. 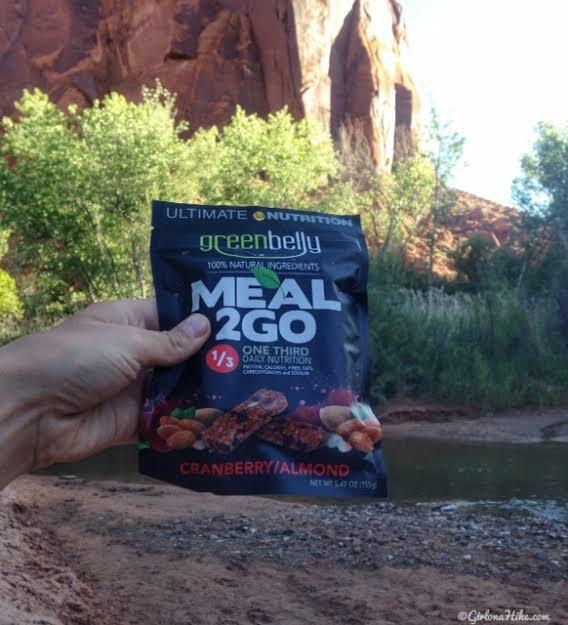 Whether you are an athlete looking to fuel your day, work in an office with no kitchen, traveling, or backpacking Greenbelly Meals are an easy, convenient, and tasty way to eat healthy while crushing the trails. You can purchase meals directly from their website or Amazon. Be sure to follow Greenbelly on facebook & instagram! Share me with a fellow backpacker!